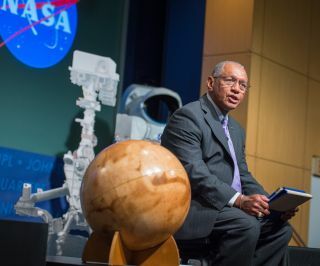 NASA Administrator Charles Bolden speaks at a public event at NASA Headquarters observing the first anniversary of the Curiosity rover's landing on Mars, Aug. 6, 2013 in Washington. NASA unveiled its 2015 budget request today (March 4), a request that seeks $17.5 billion for the agency that would fund the groundwork for some major new science missions, including a mission to Jupiter's moon Europa, but make deep cuts in the agency's SOFIA flying telescope program. "Today, President Obama released his Fiscal Year 2015 budget request for the nation, and there is a lot of good news in it for NASA. The president’s funding plan for America's space program reaffirms the path we are on, and will keep us moving forward — pushing farther in the solar system and leading the world in a new era of exploration. "Through NASA's work at all of our centers, our nation is recognized for scientific and technological leadership and knowledge-sharing that improves lives all around the world. "This budget keeps us on the same, steady path we have been following — a stepping stone approach to send humans to Mars in the 2030's. It's a path that has seen many recent successes, from the launch of the Global Precipitation Measurement mission last week -- the first of an unprecedented five Earth Science launches this year -- to returning space station resupply missions to U.S. soil with private American companies… to the power-up of Orion and the countdown toward its first flight test later this year… to the final mirrors for the James Webb Space Telescope being delivered. "This budget ensures that the United States will remain the world's leader in space exploration and scientific discovery for years to come. The budget supports the administration’s commitment that NASA be a catalyst for the growth of a vibrant American commercial space industry, and keeps us on target to launch American astronauts from right here in the USA by 2017, ending our reliance on others to get into space and freeing us up to carry out even more ambitious missions beyond low-Earth orbit. "We are committed to the International Space Station, and the latest extension guarantees we’ll have this unique orbiting outpost for at least another decade. This means an expanded market for private space companies, more ground-breaking research and science discovery in microgravity — and additional opportunities to live, work and learn in space over longer and longer periods of time. "This budget keeps NASA's deep space exploration program on track by funding the Space Launch System (SLS) and Orion crew vehicle to take American astronauts farther into the solar system than we have ever gone before. Our stepping stone approach to sending humans to Mars involves continued research on the space station, testing our new capabilities beyond the moon, exploring an asteroid and ultimately sending a crewed mission to the Red Planet. "In order to carry out these pioneering missions, we have to develop technologies for our asteroid redirect mission that will lead to the subsequent first crewed mission to Mars. "This budget funds all elements of that stepping stone approach, and actually increases funding for space technology development and other efforts that will support the first crewed flight of SLS to an asteroid. "In the coming year, we'll build on our nation's record of breathtaking and compelling scientific discoveries and achievements in space, with science missions that will reach far into our solar system, reveal unknown aspects of our universe and provide critical knowledge about our home planet. It includes funding for missions to Mars and the formulation for a mission to Jupiter's moon, Europa. It also funds science missions already heading toward destinations such as Jupiter and Pluto and operating throughout the solar system, a mission to study our planet's magnetic system, and steady progress on the James Webb Space Telescope. "Under this budget, our pioneering aeronautics research program will continue to focus on substantially reducing fuel consumption, emissions and noise — and help make the Next Generation Air Transportation System, or NextGen, a reality. "All of the investments we make at NASA help drive technology and innovation, spur economic activity and create jobs. That is why under the president's Opportunity, Growth, and Security Initiative, with Congressional approval, NASA will receive nearly $900 million in additional funding in FY15 to focus on specific priorities. This "invest in America" initiative recognizes that the type of innovation and technology development we do helps create opportunity, grow our economy and secure our future. "The Fiscal Year 2015 budget advances NASA's strategic plan for the future, and with it we'll continue to build on U.S. preeminence in science and technology, improve life on Earth and protect our home planet, while creating good paying jobs and strengthening the American economy. "The passion and dedication of the NASA workforce has taken us to new heights over the past 50-plus years. Today, we build on that strong foundation and carry out new pioneering missions to lead the world and reach even higher. Working together, we turn science fiction into science fact and make the impossible possible."